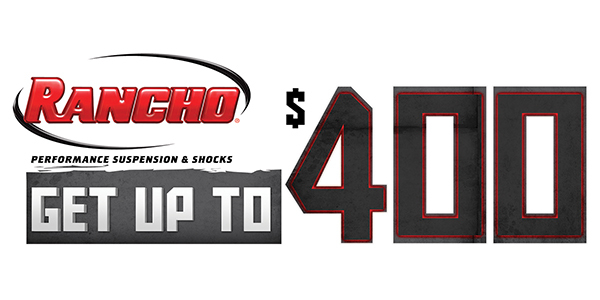 The Rancho “Get Up to $400” mail-in rebate promotion – available on purchases made between March 1 and May 31 – will offer truck, SUV and Jeep owners Visa Prepaid cards* worth up to $400 this spring. The products included in the promotion are qualifying Rancho lift kits, Rancho quickLIFT Loaded assemblies; RS9000XL, RS7000 MT, RS5000 X/RS5000 series shocks and struts; RS7000MT and RS5000 series steering stabilizers; and RockGEAR off-road accessories. Many Rancho products are covered by a performance guarantee and 90-day risk-free ride offer that lets enthusiasts try Rancho RS9000XL, Rancho RS7000MT, Rancho RS5000X shocks or Rancho quickLIFT units for 90 days. Consumers can return their shocks within 90 days for a full refund of the product’s purchase price. For a complete list of applications covered by the warranty, visit GoRancho.com.